Temples and Shrines in Nikko include 103 architectures (9 National Treasures and 94 Imoprtant National Assets) of Futarasan-jinja Shinto Shrine, Tosho-gu Temple and Rinno-ji Temple and Cultural Background of these properties. This shrine has been worshiped at since ancient times as the center of beliefs connected with the mountain worship. Large numbers of shrine buildings were erected especially during the medieval period. At the beginning of the Edo Period, the main shrine and the other shrine buildings were newly erected by the Tokugawa Shogunate. Of these, 23 buildings, including the honden (main shrine) and the Shinkyo (sacred bridge) have been designated as Important Cultural Properties. The second successive shogun Hidetada Tokugawa contributed the Honden in 1619. The building is elegant Momoyama style, and it remains original figure since the first establishment. It is designated as an important cultural property.Although, there are some decorations on the wall, it is calmer than luxurious decoration of Toshogu Shrine. Shinkyo (Sacred Bridge) is ta bridge which crosses over Daiya River. It was first constructed in Nara era (nearly 1300 years ago) and appeared the present form in early Edo era. The oldest and unique draw system briged (embeded the beam ion the both bank) in Japan. The 28m long and 7.4m wide bridge is the gate to 2 temples and 1 shrine of Nikko. The Toshogu Shrine was built in 1617 as the mausoleum of the Tokugawa Ieyasu. The main shrine buildings were built by the third shogun, Tokugawa Iemitsu in 1636. Building of the Toshogu represented the climax of the Gongen-zukuri style which characterizes Japanese shrine architecture. Skills of the highest level available at the time were applied to the architectural decoration such as carvings and coloring. Eight buildings such as the honden (main hall), the Ishi-no-ma (stone hall), the haiden (worship hall), and the Yomei-mon (tower gateway) have been designated as National Treasures, whereas further thirty-four buildings as Important Cultural Properties. Yomeimon Gate is one of the climax of Toshogu. Techniques of crafts and decoration such as coloring, metal fitting and sculpture, were gathered in the Yomeimon. People are not tired of looking at the gate all day long because of its excellence. Especially, sculptures are remarkable. The number of the sculptures is over 500. 194 sculptures are the animals of imagination. The 'Sleeping Cat' exists at the entrance of Okusha Inner Shrine, which is located in Higashikairou (East Corridor.) It is told to be made by Jingorou Hidari, and it is the most famous sculpture in the Toshogu Shrine. Also, there is a sculpture of sparrow on the backside of the Sleeping Cat. The sparrow will be eaten if the cat is awake. However, the sparrow and the cat co-exist. It means that nation wide chaos is over and peaceful society has come. 'Three Monkeies' sculpture and 'Crying Dragon' ceiling painting are also famous art in Toshogu. The origin of the Rinnoji Temple can be traced back to the Shihonryuji Temple, which was erected by Priest Shodo, the founder of the temple complex at Nikko, toward the end of the eighth century, and it developed as the central temple in the complex. However, ever since 1653, when the Taiyuin was build as the mausoleum of the third shogun Tokugawa Iemitsu, the temple was used as the religious base for the Tokugawa Shogunate. The main shrine, the Ai-no-ma room and the worship hall (haiden) of the Taiyuin Reibyo (mausoleum) have been designated as National Treasures, whereas further 37 buildings as Important Cultural Properties. 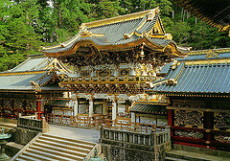 Rinnoji Temple is not a name of the specific building, but it is the generic name of Buddhist temples in Nikko. Central building of Rinnoji Temple is the Sanbutsu-doh Hall. Sanbutsu can be translated as three Buddha. In fact, three images of Buddha are enshrined inside. According to a historical record of temple, Ennin Saint Jikaku built the Sanbutsu-doh Hall by referring to Konponchu-doh Hall of Mt. Hiei. He enshrined Bato Kaonnon, Amida Nyorai and Senju Kannon in Sanbutsu-doh Hall. These images are representatives of Mt. Nantai, Mt. Nyohou and Mt. Tarou. Saint Jikaku's contribution was based on mountainous worship. These three principal images were remade in early Edo period. Excellent skills will be seen here and there. These images are 8m high, and it is the foremost seated wooden image in Japan. All of these three are coated with gold leaf. Also, an image has been formed by wooden bits, which were gathered up. Nikko is regarded as an irreplaceable site forming a cultural landscape in which nature is at one with the temple and shrine buildings. As the location of the mausoleum where the founder of the Tokugawa shogunate is enshrined, the registered sites played an important historical role in underpinning the political structures of the Edo Period. Daimyo from all over Japan came to Nikko to worship at the shrines and temples, which were also visited by successive shoguns themselves, by envoys dispatched from the imperial court in Kyoto, and by parties of diplomatic envoys sent from Korea. In addition, the wooded area in the vicinity of the building complex is regarded as sacred in the beliefs relating to the mountain worship in Nikko.